Cape Town - Bongi Mbonambi will make his first start for the Springboks against Italy in Padova, while Pieter-Steph du Toit returns to the starting team for Saturday's third Test in the Outgoing Tour. Furthermore, the uncapped Warrick Gelant has been included on the bench and will make his Springbok debut should he go onto the field of play during the match. The Springbok management decided not to risk Malcolm Marx for this weekend's match, following the shoulder injury he sustained last week against France. This means Mbonambi, who has 12 Test caps to his name, will earn his first start on Saturday. Chiliboy Ralepelle will join Gelant on the bench. Du Toit is fit again and picked at flank, where he replaces Siya Kolisi, who is not available for this match because of the birth of his second child. The versatile Du Toit suffered concussion two weeks ago against Ireland and as a result he missed the Springbok victory over France in Paris. The rest of the team that edged the French in the Stade de France in the previous outing is retained. 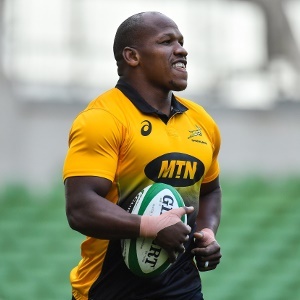 “We decided not to risk Malcolm, which means Bongi will get a well-deserved first start in the No 2 jersey,” said Springbok coach Allister Coetzee. “Bongi has worked hard and I have no doubt he will grab this opportunity with both hands, as will Chiliboy, should he get a run. Coetzee said the Italians will pose a difficult challenge at home: “We respect the Italian side, they are well coached and I know they will be up for the challenge. However, we focus on ourselves and a disciplined and clinical performance is what is needed this weekend. “It would be important for our pack to again create a good platform of which to play from and therefore our set piece will be key in the expected wet conditions,” said Coetzee. Eben Etzebeth will again lead the Springboks after the big lock has shrugged off a lower leg injury, which he suffered in Paris. Play gets under way at 16:00 SA time.